Overview: Krill is a shrimp like crustacean that lives deep in the ocean. They are free of almost all impurities including mercury. 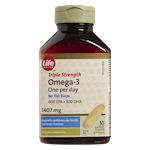 You know that fish oils are excellent sources of the omega-3 fatty acids, EPA and DHA. Krill oil is a naturally pure source of EPA and DHA. 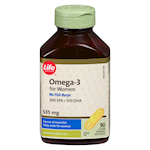 Life Brand Wild Krill Oil 500mg softgels contain a high quality source of wild krill oil and are a convenient way to supplement your diet Benefits: Source of omega-3 fatty acids (EPA and/or DHA ) for the maintenance of good health. Helps support brain function. Helps maintain/support cardiovascular health. 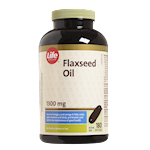 Helps to relieve symptoms of dysmenorrheal and premenstrual syndrome. 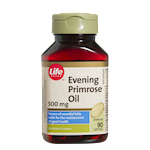 Helps to reduce serum triglycerides/ triacylglycerols in conjunction with conventional statin therapy. 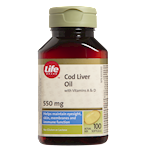 Helps to reduce the levels of LDL cholesterol in conjunction with conventional statin therapy. 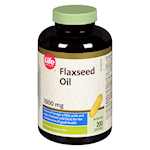 Helps to increase the levels of HDL cholesterol in conjunction with statin therapy. Helps to reduce pain associated with osteoarthritis. This product contains 4.4 calories and 2.2 mg of sodium per softgel. No gluten, lactose, soy, yeast, preservatives, artificial flavours or colours. (Adults): Take 2 softgels daily or as directed by your health care practitioner.